If you happen to be spending this summer in Bahrain, then you’re probably searching for exciting places that will shelter you from the heat. Luckily, Bahrain is filled with options that will keep your summer days cool. Whether it’s a day of shopping, dining, or even adrenaline-fueled activities, Bahrain has it all. The Pearl of Arabia is a one-stop destination for an unforgettable summer. So plan out an unforgettable summer that promises nothing but a cool breeze at these indoor destinations in the kingdom of Bahrain. There’s no denying the fact that summer makes us lazy. We’re too tired to exert any kind of energy, except when it’s entertaining. 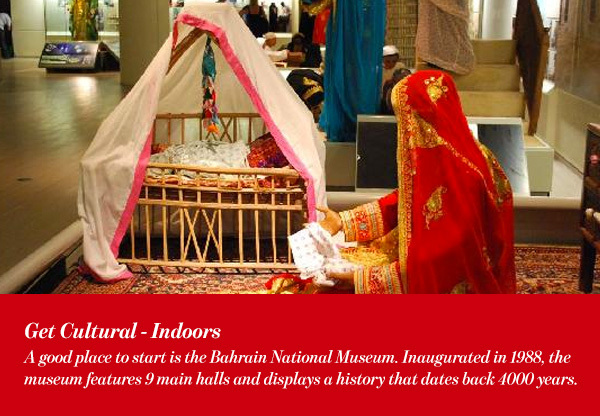 So why not head on out to one of Bahrain’s many historical and cultural sights. A good place to start is the Bahrain National Museum. Inaugurated in 1988, the museum features 9 main halls and displays a history that dates back 4000 years. Furthermore, you can visit the Bahrain Science Centre with the young ones for a day of edutainment. The center will surprise you with its exhibits, experiences, and interactive zones. You will also gain some insight into the earth, human health, and even witness 36 animal skeletons. If, however, science and history don’t interest you, then why not visit any one of Bahrain’s rivetting Art Galleries. It’s a way to discover local artists and indulge in a cultural experience all while escaping the scorching sun. Summer in Bahrain can be a delightful experience if you know where to go. For those who love spending hours and hours in the same place, then Bahrain’s malls are all you are looking for. Within the safe, cool walls of Seef Mall, you will be able to explore a variety of options. 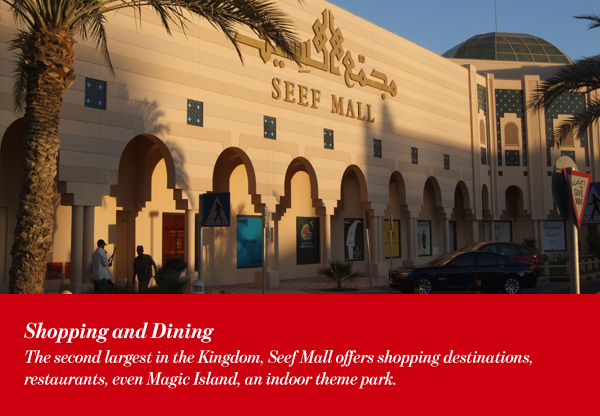 The second largest in the Kingdom, Seef Mall offers shopping destinations, restaurants, even Magic Island, an indoor theme park. You can also visit Moda Mall, located in the Bahrain World Trade Centre. Here, you can expect to find international brand boutiques, cafes, and restaurants that will keep you satisfied for a day or more. For those who are seeking an adventurous summer in Bahrain that won’t leave you sweating and miserable, here are indoor activities to try. For example, you can spend a night singing at the top of your lungs at any of the Kingdom’s karaoke venues. Or you can visit Ozone Entertainment at Sitra Mall for an evening Laser Tag. Ozone also offers games, billiards, and bowling. 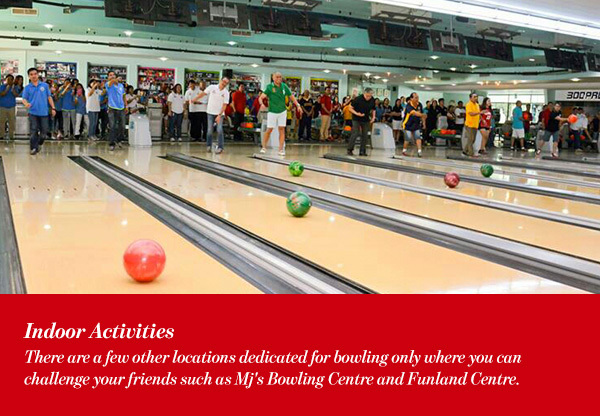 There are a few other locations dedicated for bowling only where you can challenge your friends such as Mj’s Bowling Centre and Funland Centre. Finally, make sure you try out ice skating at Funland Centre’s ice rink. After all, there’s no better way to cool off and escape the heat of summer in Bahrain. Although not entirely indoors, water parks are another great idea for the summer. Even if you’re splashing about under the sun, the cool water will make the whole experience fun and enjoyable. 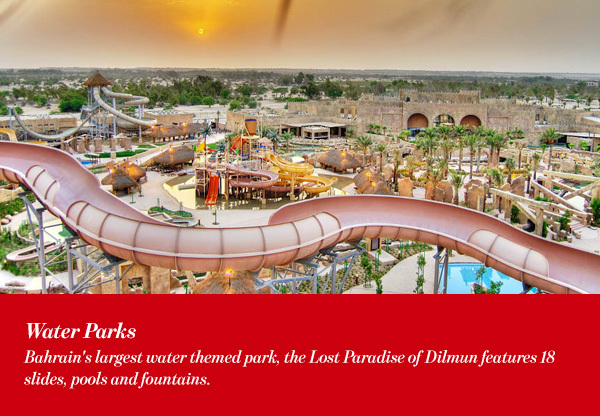 Bahrain’s largest water themed park, the Lost Paradise of Dilmun features 18 slides, pools and fountains. Moreover, it is home to the only wave pool with a sandy beach in the Middle East and is based on Bahrain’s rich history. You can also dedicate another day to Wahooo! Water Park, the Middle East’s first indoor-outdoor waterpark. Here, you can enjoy 15,000 square meters of rides, attractions, shopping, and restaurants. The park is 30% outdoors and 70% indoors, which means you will be able to avoid the sun and heat while swimming in water that is kept at 30 degrees all year long. If all else fails, then take a relaxing day off and visit a spa. This will not only keep you cool, it will also boost your mood and leave you feeling energized and ecstatic. The options are endless when it comes to a day of pampering. 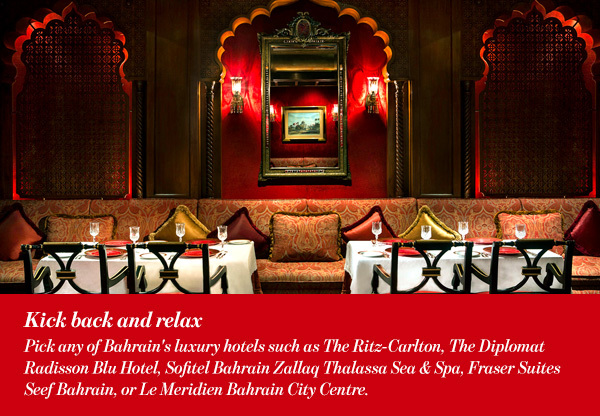 Pick any of Bahrain’s luxury hotels such as The Ritz-Carlton, The Diplomat Radisson Blu Hotel, Sofitel Bahrain Zallaq Thalassa Sea & Spa, Fraser Suites Seef Bahrain, or Le Meridien Bahrain City Centre. There are also numerous Wellness Centres you can choose to visit.